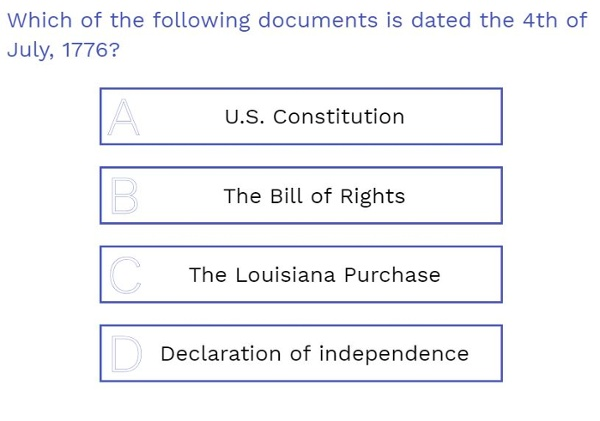 We start the poll with a basic American history question asking which document was signed on the 4th of July, 1776. We expect nearly all your students will know the answer, regardless it is a great reminder of what we celebrate on this fine day. Next, we move on to some math about a problem that that many of us encounter every year when planning a BBQ. The number of buns and the number of hot dogs just don’t match! We ask students to find the least common multiple of 6 and 8 to see just how big a party they would need to throw to have a perfect match. Practicing problems with least common multiples…check. Thinking about food waste and business marketing… check. For added fun, ask your students to draw a picture to justify their reasoning or solve the problem in two or three different ways. The scratchpad is also a great place to put reminders or fun facts relating to the problem. The rest of this poll is aligned to Algebra I standards on modeling linear inequalities, graphing them and transforming them. Tasks 3 and 4 have students imagine they are throwing a mini-firework show for their school and need to stay within the constraints of their budget and time expectations. If they get the math right, they will find that they do not have enough money to make the show long enough. If this were a real situation, these types of analysis would be helpful in arguing for a larger budget, lower permit costs or shorter time requirements. Task 5 asks them to identify which graph is a solution to the inequality. I like making tasks like this with screenshots of actual graphs merged into one image for a tap-an-image multiple choice. The visual display of the heatmap can lead to some productive discussions in the classroom, especially if you have the “show answer” button turned off. If you do, the projected results will be a heatmap of student responses. This is a great time for a whole class or small group discussion (try the automatic grouping feature) about the task. If you want, you can create a copy of this task and then run it again after the discussion to see if everyone converges on the correct answer. 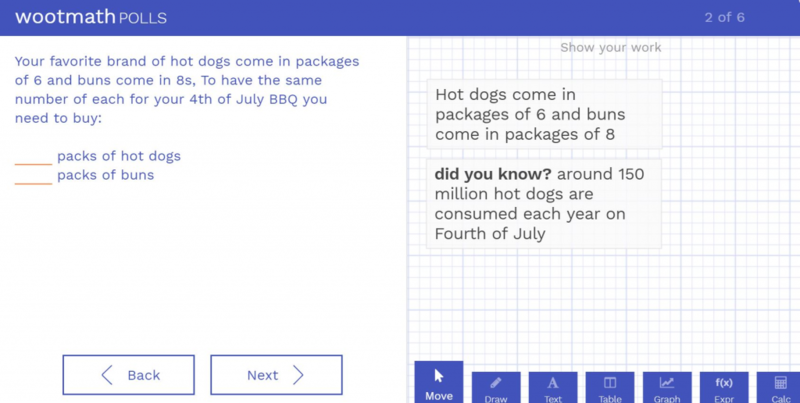 Get started by previewing the poll right now, or login to wootmath.com and search for 4th of July in the Shared Gallery.